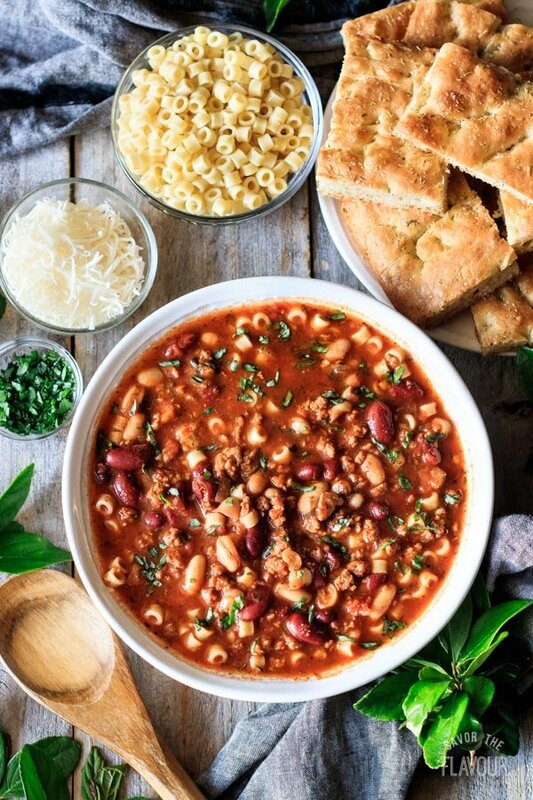 Pasta e fagioli soup is an easy weeknight recipe that is a popular Italian comfort food. This simple homemade version is made with beans, Italian sausage, tomatoes, and cheese. 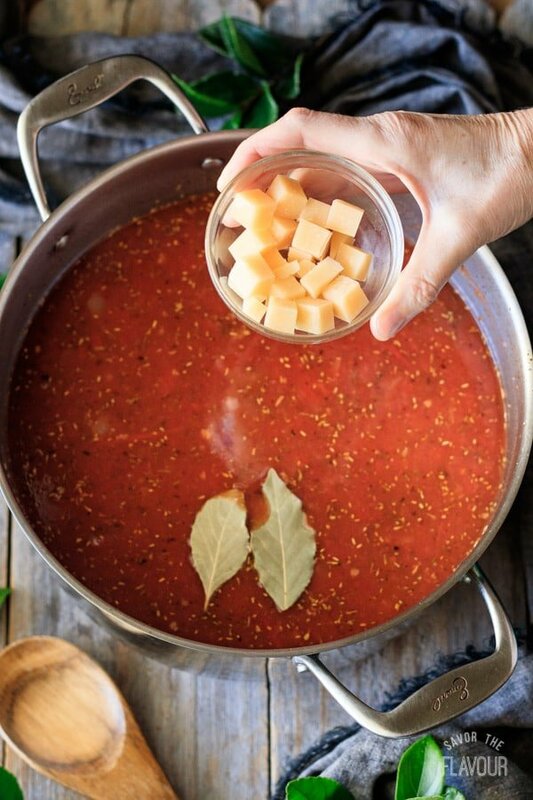 Serve this healthy, hearty stovetop soup with pasta and rosemary focaccia for dinner tonight! Looking for an easy comfort food to serve for supper tonight? 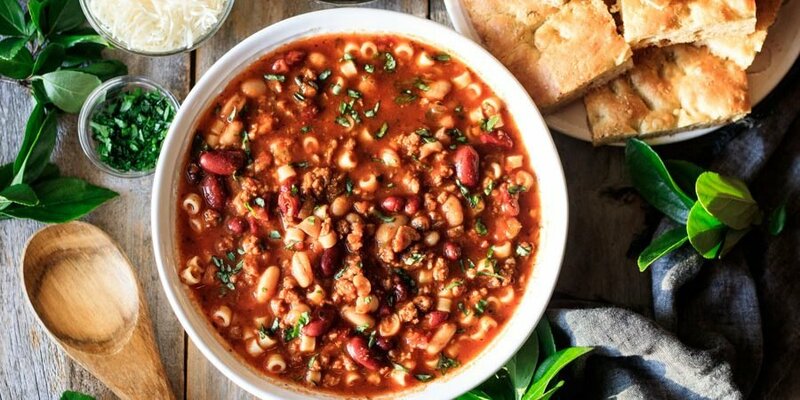 Why not try this pasta e fagioli soup. You can be enjoying a steaming bowl of this hearty soup in just over an hour, so it’s perfect for a weeknight meal! It is a traditional Italian soup that is made of beans and other inexpensive ingredients like onions and pasta. 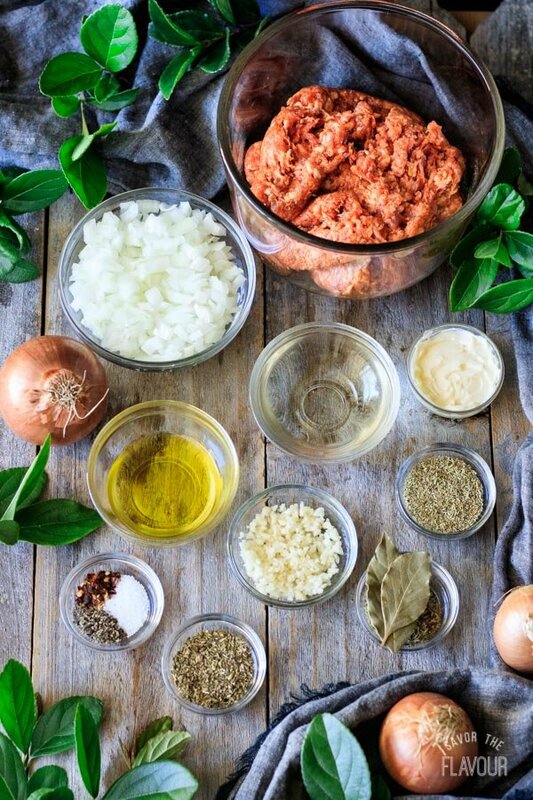 It started as a peasant dish, but it’s very popular throughout Italy because it’s delicious and timeless. Americans would call it comfort food or soul food. 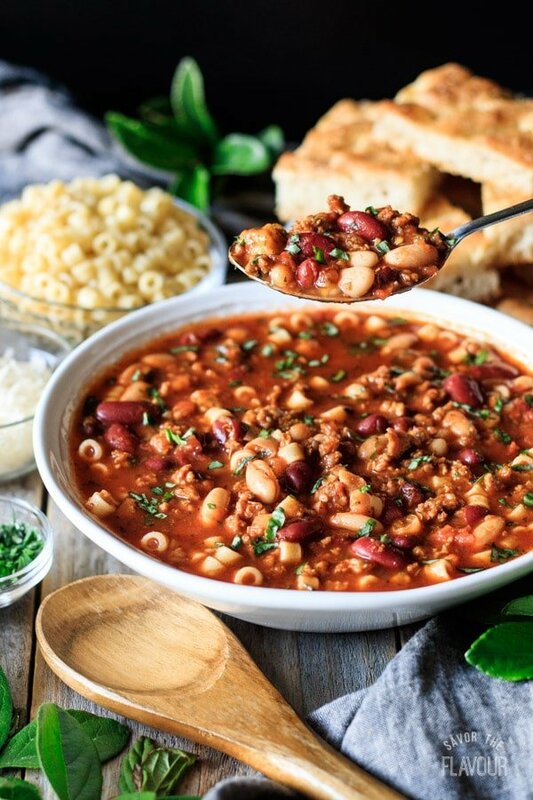 What does pasta e fagioli mean? If you translate it from Italian, it means pasta and beans. How do you pronounce pasta e fagioli? The Italian name is pronounced PAH-stah eh fah-JOL-ee. Click here to listen to the audio pronunciation. Where did pasta e fagioli originate? 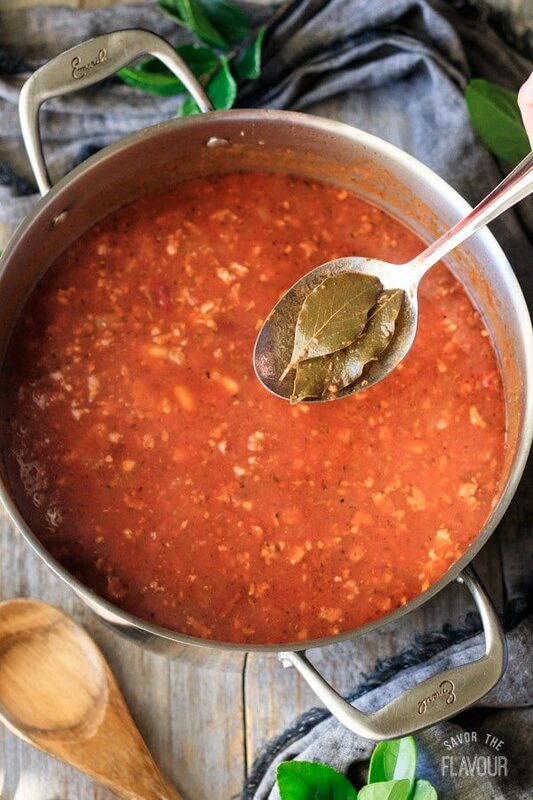 This soup comes from Italy and was originally from either the Northern or Central (Tuscan) regions of Italy. 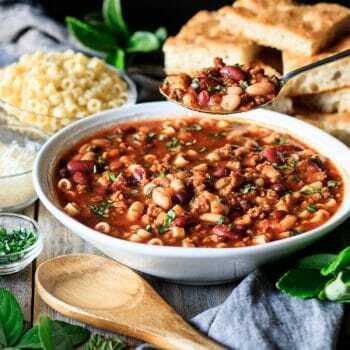 What is an authentic pasta e fagioli recipe? 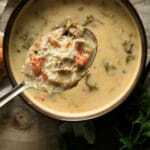 It all depends on the region or province in Italy, as there are many different variations of this soup. Each Italian household makes their own twist on their region’s classic recipe. There are three regional versions: Venetian style, Roman style, or Neapolitan style. Most agree to start with dried beans, either cannellini or borlotti. The bean soaking water is used instead of stock. Most people differ on whether to serve it with meat or without. Many Italian Catholic families would serve it on Fridays without meat. Another variation is whether to blend some of the beans to make it creamy, or leave the beans whole. Some cooks use tomatoes, but some don’t. Most Italians can agree that you can use any pasta you want, as long as it is small enough to fit on a spoon along with the beans. What is the difference between minestrone soup and pasta e fagioli? The main difference between these two popular Italian soups is minestrone has lots of different vegetables, less beans, and no meat. Pasta e fagioli soup sticks to onion, leek, garlic, or celery for vegetables, has lots of beans, and can have pork in it. 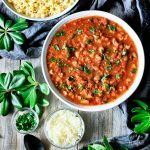 What do I serve with pasta e fagioli soup? Since this soup is more like a stew, it can be a meal by itself. Serve it with a good crusty bread, like our rosemary focaccia. You can round out your meal with our Caprese pasta salad. 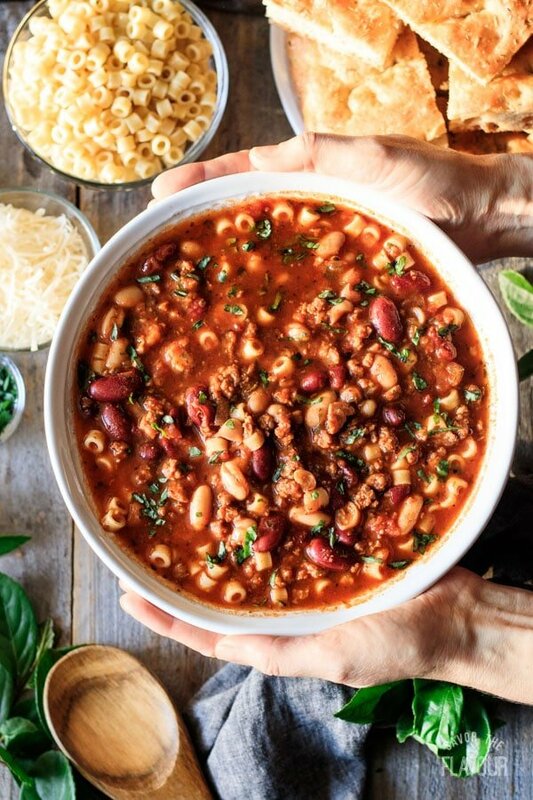 How to make pasta e fagioli in the crock pot? Cook the Italian sausage in olive oil and butter over medium high heat until its brown. Drain well, then add to the crock pot. Sauté the onion in 2 tablespoons of the rendered fat until soft, then add the garlic and cook until fragrant. Add the oregano, thyme, and rosemary and cook for one minute for the spices to bloom. Deglaze the pan with white wine to remove the fond. Add the tomato paste and cook for a minute, stirring constantly. Dump the onion, garlic, tomato paste mixture into the crock pot. 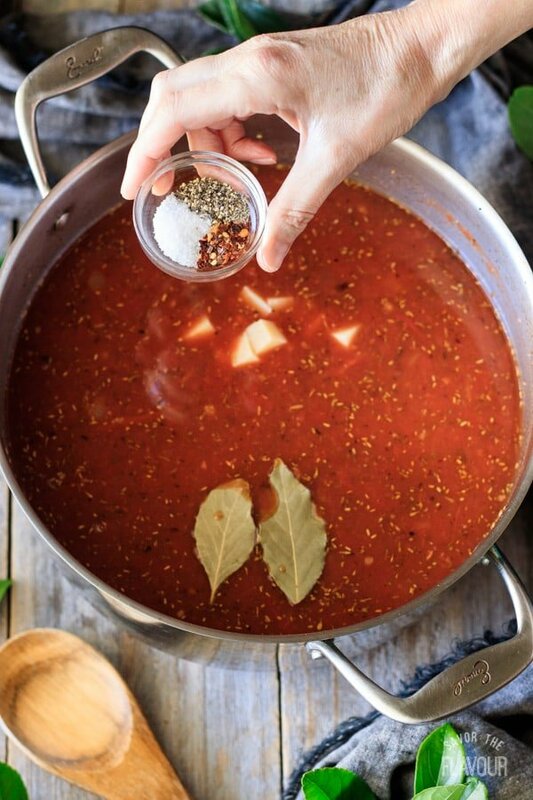 Add the crushed tomatoes, chicken broth, bay leaves, salt, black pepper and red pepper flakes to the crock pot. Stir and cover. Cook on high for 3 to 4 hours or on low for 7 to 8 hours. Twenty minutes before serving, cook the pasta to al dente and keep it separate. Just before serving, stir the fresh parsley into the soup. Place the pasta in individual bowls, ladle the hot soup over the pasta, and garnish with grated Parmesan cheese and fresh basil. Gather all your ingredients. Take the sausage out of it’s casing. Chop the onions and mince the garlic. Grate the cheese and cut the rind into 16 cubes. Rinse the beans, and chop up the fresh parsley and basil. In a Dutch oven, over medium high heat, melt the butter and heat up the olive oil until it shimmers. Cook the Italian sausage until it is brown. While it cooks, break up the pieces of meat until they are small. Remove the meat from the pot. Drain and place on a paper towel lined plate. Pour the fat into a small bowl. In two tablespoons of rendered fat, saute the onions until soft and the garlic is fragrant. Add the thyme, oregano and rosemary and cook for a minute until the spices bloom. Pour in 1/2 cup of white wine to deglaze the pan. Use a wooden turner to scrap the delicious fond off the bottom. Cook the tomato paste for a minute then pour in the crushed tomatoes with their juices, the chicken broth, beans, cooked sausage, two bay leaves, and the cubed Parmesan rind. My girls love the rind, and are so excited when they get a spoonful, of this comforting soup, with a rind cube. Add the salt, black pepper and the red pepper flakes. Stir until well combined. Cover and bring to a boil over medium high heat. Reduce the heat to medium low and simmer for 20 minutes, stirring occasionally. During the last 2 minutes of cooking, stir in the chopped fresh parsley. Taste and adjust seasonings, if necessary. While the soup is simmering, cook the pasta to al dente. Drain. Rinse under cold water. Allow to drip dry. Transfer to a bowl and toss with olive oil. Remove the two bay leaves. Remove the soup from the heat. 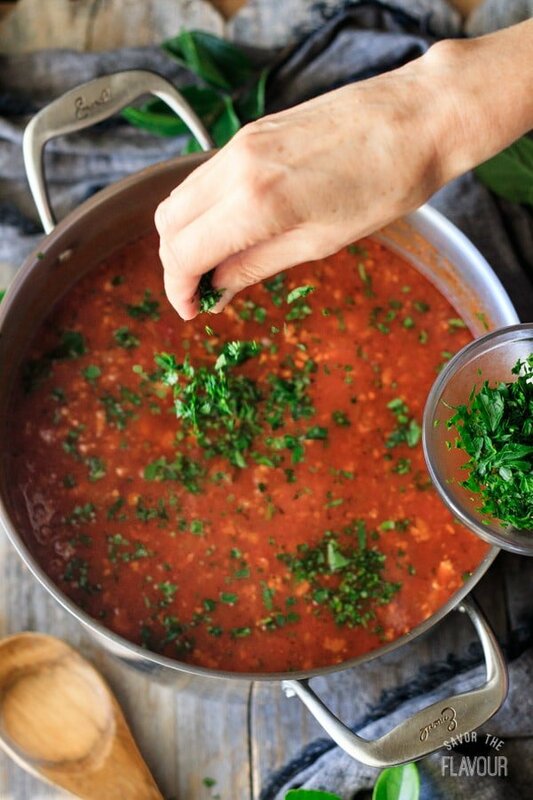 While the soup rests, sprinkle on some freshly chopped basil. It’s all done. Now, you just need to garnish it. This soup is one of those soups that tastes even better the next day, so make sure to keep some leftovers. 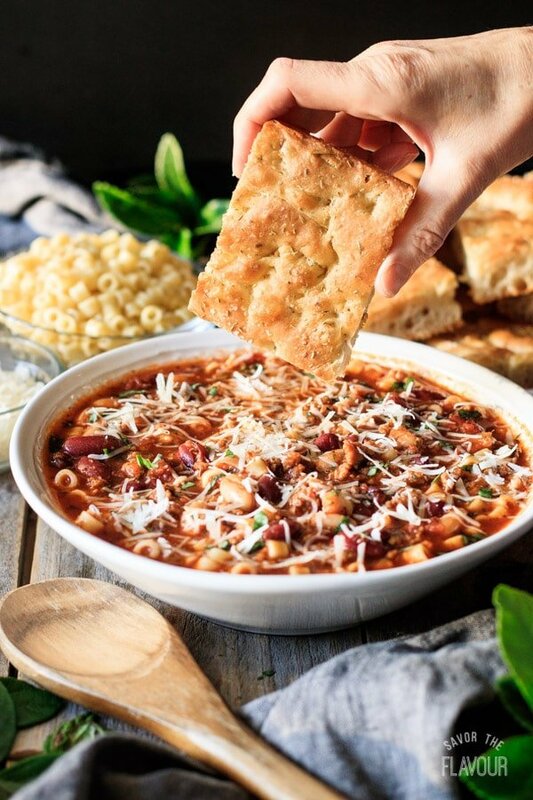 Enjoy a hot bowl of pasta e fagioli soup. Serve over cooked pasta and garnish with more basil and freshly grated Parmesan cheese. Want to use dried beans? Use the overnight or quick soak method. Want other beans? Try borlotti, cranberry beans, or pinto beans. Don’t want stock? Use the bean water or filtered water. Want this vegetarian? Omit the sausage and broth. Use filtered water or bean water. Need this vegan? Omit the butter, sausage, broth, and cheese. Use filtered water or bean water. Want other vegetables? Try celery and leeks. Want a different meat? Try pancetta, salt pork, or bacon. Don’t want tomatoes? Omit the tomatoes and the tomato paste. Want this creamy? Puree all, half, or one cup of the beans. This will also thicken the soup. This soup should not be brothy. Make it thick, like a stew. Keep the soup mostly beans with a little bit of pasta. Keep cooked pasta separate, and add it to individual bowls just before serving. Want a different cheese? Try Pecorino. Want a different garnish? Try a sage leaf, drizzle of olive oil, or homemade croutons. Need to make this ahead? It actually tastes better the second day, so go for it! 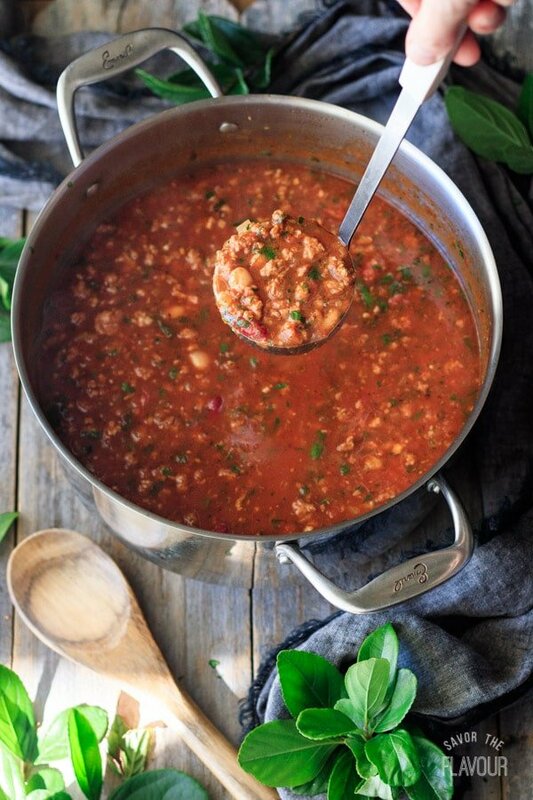 Craving more Italian soups? You’ll want to try these ones for sure! 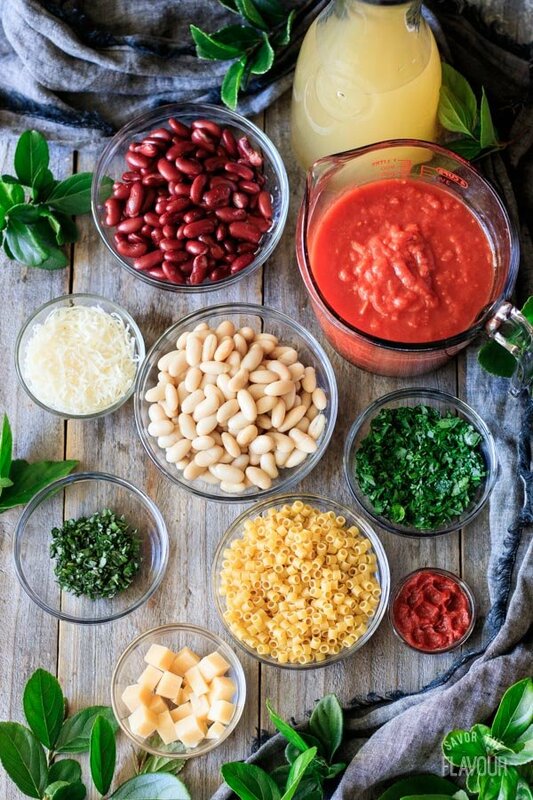 Classic Minestrone Soup: this flavorful vegetarian soup takes just 35 minutes of prep time. Zuppa Toscana: potatoes, kale, sausage, and bacon make this stovetop soup really delicious. Italian Wedding Soup: bite-sized homemade meatballs and spinach served in a beautiful broth. The pleasure of a 5-star review of this pasta e fagioli soup would be greatly appreciated. Add the butter and oil to a Dutch oven set over medium high heat and heat until shimmering. 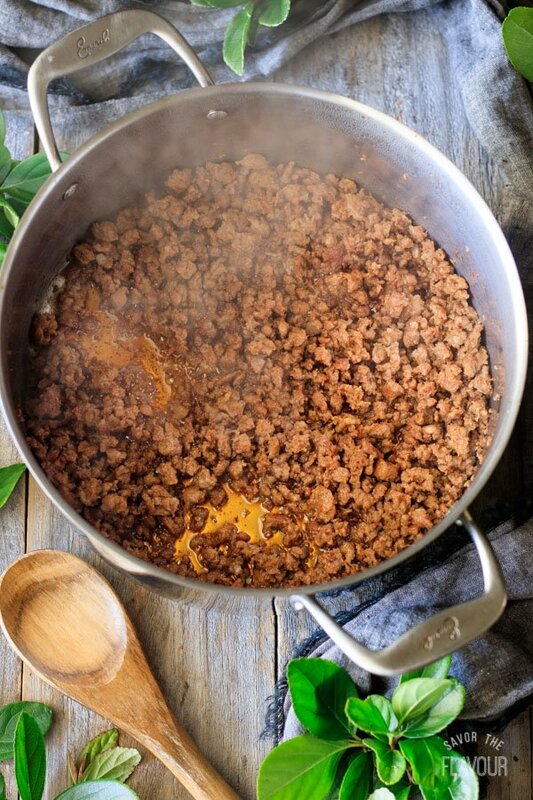 Dump the Italian sausage into the Dutch oven and cook until no longer pink, breaking it into smaller pieces with a metal spatula. Drain the meat well in a colander, reserving the fat in a bowl. 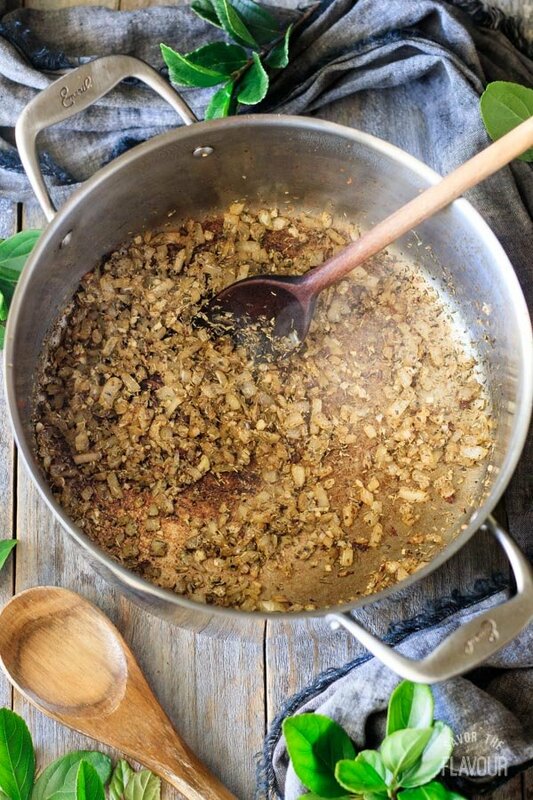 Pour two tablespoons of the rendered fat into the pot and heat over medium heat. Saute the chopped onion for 4 minutes, stirring occasionally, and then add the minced garlic and cook until fragrant. Add the rosemary, oregano, and thyme and cook for a minute, stirring constantly. Deglaze the pan with the white wine to remove the brown fond from the pan. Add the tomato paste and cook for one minute, stirring constantly. Pour in the crushed tomatoes with their juices and the chicken broth. Mix in the cannellini and kidney beans, cooked sausage, parmesan rind, bay leaves, salt, black pepper, and red pepper flakes. Cover and bring to a boil. Reduce heat to medium low and simmer for 20 minutes, stirring occasionally. During the last 2 minutes of cooking, mix in the chopped fresh parsley. Taste and adjust seasonings, if necessary. While the soup is simmering, cook the pasta in salted boiling water. Undercook it by 3 minutes so it’s al dente. Drain in a colander, rinse with cold water, and allow to drip dry. Transfer to bowl and toss with olive oil to coat. 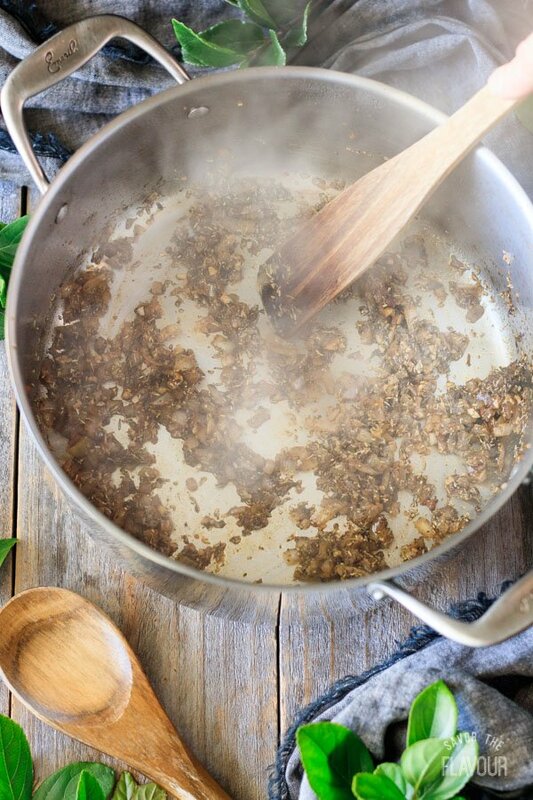 Remove the soup from the heat and take out the two bay leaves. Let the soup rest for a few minutes. To serve, add some pasta at the bottom of each bowl then ladle the hot soup on top. Garnish with a sprinkle of grated Parmesan cheese and a few fresh basil leaves. Serve with a crusty bread like our rosemary focaccia.